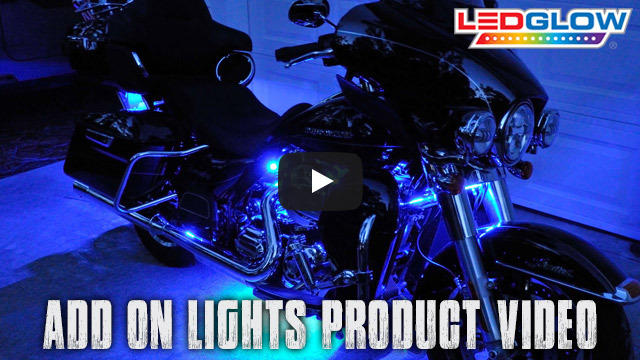 LEDGlow's Advanced Million Color Motorcycle Add-On Power Harness allows you to add additional lighting strips to your existing motorcycle kit. LEDGlow's Advanced Million Color Motorcycle Power Harness allows you to add additional lighting strips to your existing motorcycle kit. These add-on power harnesses are only compatible with LEDGlow's Advanced Million Color Motorcycle Lighting Kit. These lights are very bright I love them. I bought the 10 pc. Million color kit and then added 4 more 3 inch strips for the underneath of the bike. The add on harnesses work great and it makes it easier to add more lights. Thanks to the add on harness I was able to double the number of LED light strips on my 2016 HD Road Glide Ultra, the harness is easy to install, just plug n play. Sales department was great and the shipping was fast. I would highly recommend LED Glo to anybody wanting to improve visibility of their motorcycle. You can't have too many lights!! Great product and service.